Some exposure to sunlight can be enjoyable; however, too much could be dangerous. Overexposure to the sun's ultraviolet (UV) radiation can cause immediate effects such as sunburn and long-term problems such as skin cancer and cataracts. The UV Index, which was developed by the National Weather Service and the U.S. Environmental Protection Agency (EPA), provides important information to help you plan your outdoor activities to prevent overexposure to the sun's rays. 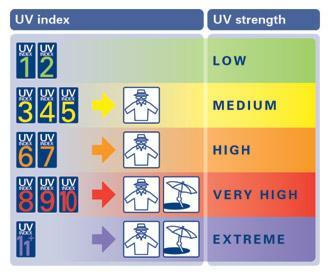 The UV Index provides an indicator of the expected risk of overexposure to the sun. The Index measures UV intensity levels on a scale of 1 to 11+, where low indicates a minimal risk of overexposure and 11+ means an extreme risk. The UV Index takes into account clouds and other local conditions that affect the amount of UV radiation reaching the ground. By taking a few simple precautions, you can greatly reduce your risk of sun-related illnesses. no business being outside in the first place. sunscreen if you will be outside for long periods. Stay in the shade between midday and 3pm when the sun is at its strongest. they believe there is no need for caution. Try to avoid exposure to the sun between 10am and 4pm. Otherwise seek shade, cover up, wear a hat and sunglasses and use sunscreen. Seek shade, cover up, wear a hat and sunglasses and use sunscreen. Avoid the sun between 9am and 5pm. Take all precautions possible. Unprotected skin can burn in minutes if not seconds. Do NOT underestimate the power of the sun. It WILL get you! and increase UV exposure and will greatly speed up burn times.